Hyundai Heavy Industries is venturing into the lithium-ion battery market for electric cars, hoping to bask in the soaring demand for long-range, environmentally friendly next-generation vehicles. The world’s largest shipyard said it clinched an agreement Monday with Canadian auto parts maker Magna E-Car Systems to launch a $200 million joint venture. The Korean company would take a 40 percent stake and the Ontario-based firm the remainder. Magna E-Car is another partnership between Magna International Inc. and the Stronach Group, a private company owned by Frank Stronach, who founded North America’s top car parts supplier. Magna E-Car supplies the powertrain to Ford Motor Co. for the plug-in version of its Ford Focus. Under the plan, Hyundai Heavy and Magna E-Car will carry out joint research and set up a production line in the Canadian province, aiming to churn out 1,000 battery packs annually starting 2014. The shipbuilder added it will further boost its output to 400,000 by 2018 and 800,000 by 2020 by building an additional eight plants in Europe and North America. It targets a 30 percent share in the electric car market in the regions by 2020. “We want to jump into a global, integrated eco-friendly energy group by preempting the fledgling market in Europe and North America and actively propelling our power storage system operations,” said Lee Choong-dong, senior executive vice president of Hyundai Heavy’s green energy unit. The alliance signals the Ulsan-headquartered shipyard’s intensifying foray into the rapidly growing renewable energy industry and efforts to diversify its growth structure. Though a relative newcomer to the car battery market, Hyundai Heavy said it has since 1992 been engaged in developing components for electric vehicles. With the new green energy arm installed last year, the company currently runs solar and wind power stations in the country’s south and is constructing a thin-film solar cell factory in Ochang, North Chungcheong Province. Company officials also expect the latest joint venture will facilitate securing energy storage technologies for solar and wind power generation, which are used to store electricity and transfer the load to a later time, thus cutting utility costs. 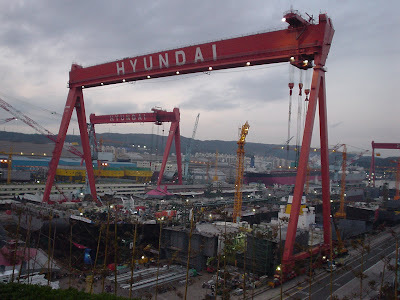 “Hyundai heavy’s highly vertically integrated operations, as well as its edge in electrical, electronics and engineering technologies, will somewhat help offset its late entry to the market,” said Lee Jong-hwan, an analyst at Dongbu Securities in Seoul. SK Securities Co.’s Lee Ji-hoon echoed his view, saying the new project would create synergy with the firm’s existing electrical and electronic business despite a recent slowdown in the global renewable energy sector, chiefly driven by Europe.